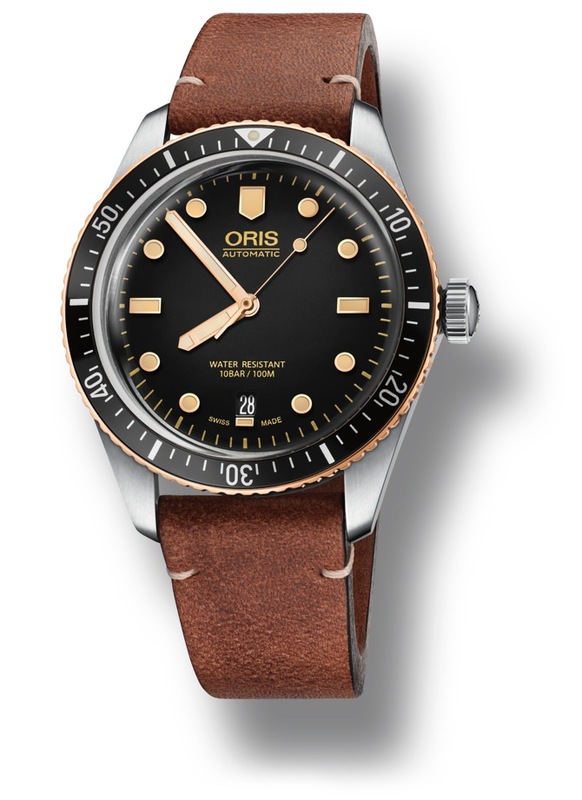 Why a Man Needs a Diver Watch - Oris | Valet. Classic looks with a rugged exterior, you can't beat this go-anywhere timepiece. Every man needs a dive watch. But not because we think every man should be diving. In fact, even divers don't really use them all that much. If you scuba dive, you likely have a dive computer strapped to your wrist. What we're saying is that every man should want a dive watch. Because they're rugged machines that always look right on a man's wrist. That's why they've long outlasted their time as an essential piece of sporting equipment. Back during the post-war period of the 1950s, diving was growing in popularity as a sport, thanks to Jacque Cousteau's introduction of the Aqua-Lung and his popularization of sea exploration. A surge of dive watches entered the consumer market and today, the dive watch has become one of the most popular watch styles in the world because of its versatility and sporty appeal. 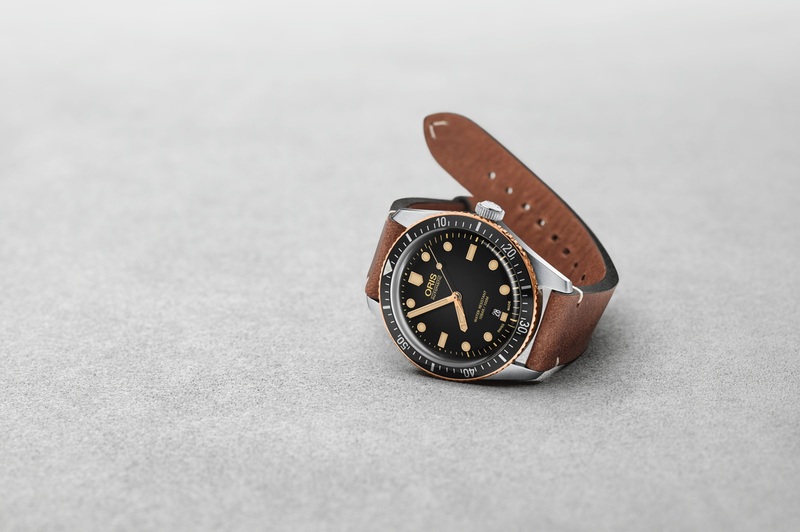 So what exactly makes a timepiece a dive watch? A few key features separate a dive watch from other sports watches. For starters, they must have at least 100 meters of water resistance. Many models include a helium release valve to protect against damage from potential helium saturation. And even more have a unidirectional rotating bezel with distinct markings to highlight or differentiate the first fifteen minutes, which allows elapsed time to be easily tracked. Take the Oris Divers Sixty-Five, a revival of the iconic diver's watch that first appeared in the Oris collection half a century ago. 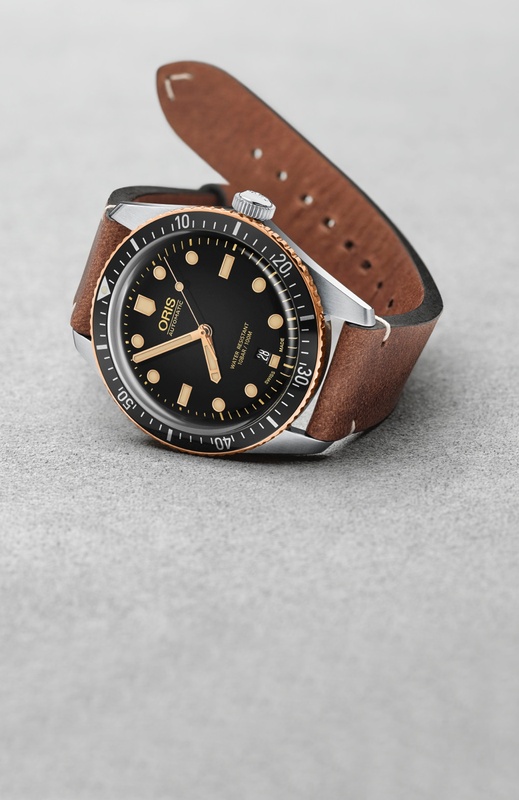 The new model, which can be configured in multiple styles (including with this bronze bezel and old school leather strap) shares the throwback looks of the original, but it's been modernized using cutting edge watchmaking techniques. The case is crafted from anti-corrosive stainless steel. And the archival-inspired bubble-curved glass is made of scratch-resistant sapphire crystal and comes with a unique anti-reflective coating on the inside to reduce glare and increase legibility underwater. Or the Aquis Date, a classic looking dive watch that boasts a case, bezel and bracelet made of stainless steel, the ultra-rugged metal that gives the timepiece an extra level of performance, along with a gleaming polish that gets better with the patina of age. 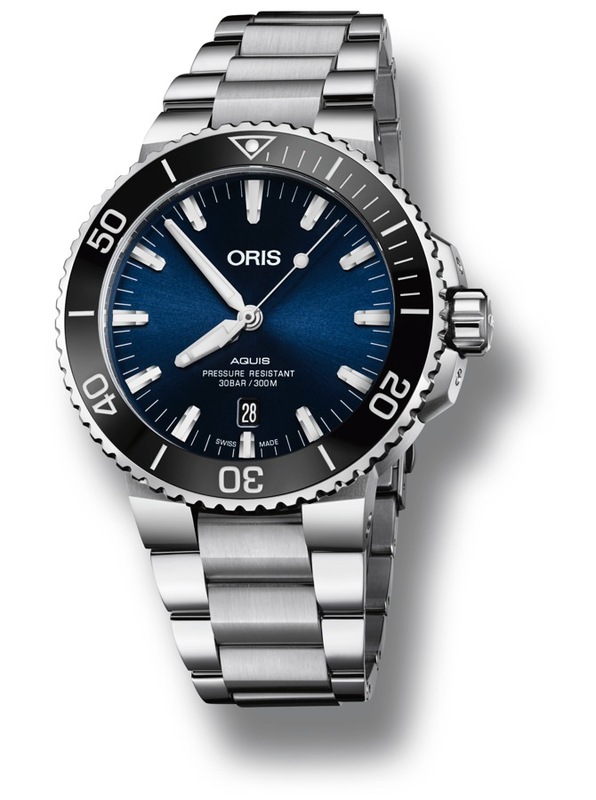 Oris's designers have given the case an elegant, fluid profile that means not only is the watch practical underwater, it's also comfortable transitioning to both casual and formal occasions on dry land. Then there's the new Oris ProDiver GMT, a serious tool watch with impeccable diving credentials, thanks to the intel offered up by professional divers which helped develop the original ProDiver. 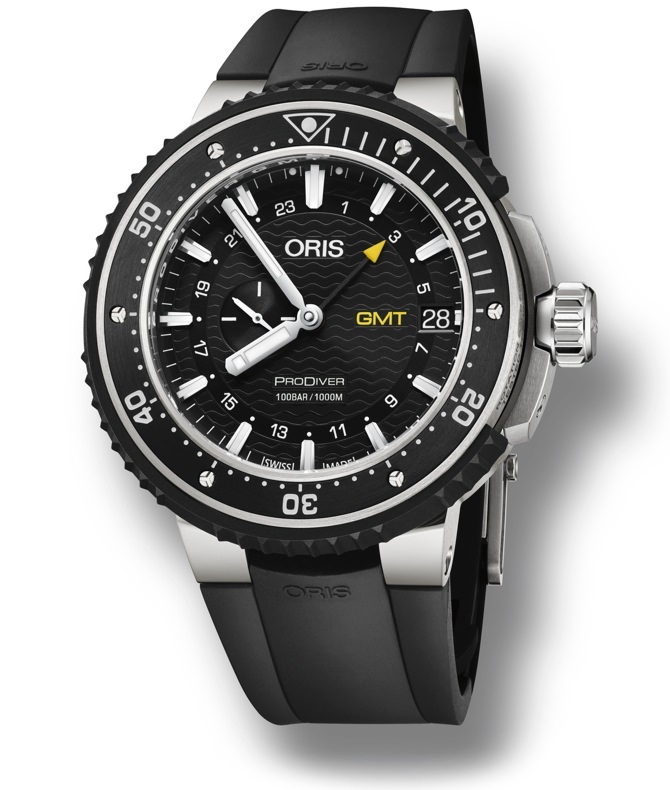 It features a second time zone and Oris's patented Rotation Safety System bezel lock. This pioneering innovation is typical of Oris's inventive spirit and has made the ProDiver one of the most respected watches in the professional diving community. The latest GMT model features a 24-hour second time zone, indicated by a central pointer hand, a lightweight 49mm titanium case and, of course, a Swiss made mechanical movement. All three are as durable as they are good looking, not to mention water resistant—essential tenets of a dive watch. Like your favorite pair of boots, these timepieces are wardrobe workhorses that you can wear anytime and any place. They're cool and comfortable, but will always ensure you look and feel put together. It's often said that the rotating bezel helps you keep track of your oxygen. But the timing bezel does one simple thing—track the passage of time, up to an hour. The bezel can be used for a few things: timing total dive time, swim distances and surface intervals. But it shouldn't be used to tell how much air is left in your tank.